Extraction technique of 99mTc extraction from 99Mo was examined by the newly developed Technetium Master Milker (TcMM) method. For the production of 99Mo here, the 98Mo(n,g) reaction using neutrons generated by a nuclear reactor and/or the 100Mo(g,n) reaction using bremsstrahlung photons generated by an electron linear accelerator were utilized respectively. 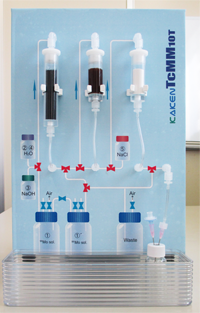 By this study, it has been proved that a highly concentrated pure pertechnetate (99mTcO4-) in saline can be separated and collected through the TcMM method. Procedurally, the TcMM method utilizes combined activated carbon (AC) and alumina (AL), with or without ion exchange resin (IER). The AC-AL process has used a highly concentrated Mo with low specific and large activity 99Mo of 3.0x1012 Bq generated by the irradiation of neutrons in the nuclear reactor, JRR-3 in Japan Atomic Energy Agency. It was found that a chemical yield and purity of the produced 99mTc are 90-95% and 6N (99.9999 %), respectively. Therefore, the TcMM method is able to generate a high quality 99mTcO4- that is eligible to obtain the permission of pharmaceutical affairs law. It is revealed that the TcMM method has the practical capability of the efficient 99mTc generator with a wide range from small amount level (kBq) to large level (TBq) per batch, furthermore, the main parts consisted of the AC-AL or AC-IER-AL columns system are simple and are able to collect pure 99mTc within 30 min automatically. 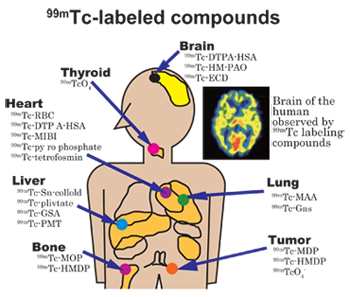 Conclusively, 99mTc can be produced domestically and further locally on demand by the combination of the TcMM method and 99Mo with a low specific activity (produced from the 98Mo(n,g) and/or 100Mo(g,n) reaction, using a neighboring reactor and/or an electron linear accelerator without enriched uranium (HEU and LEU)), and furthermore, the advanced use for diagnosis can be available everywhere in the world. Irradiated natMoO3 pellets are dissolved in a molar equivalent NaOH solution, and the resulting Na2Mo(99Mo)O4 solution with the neutral pH can obtain. Using the TcMM system, Na2Mo(99Mo)O4 solution (max. 1000 mL) is poured into AC column at a flow velocity of 100 mL/min for 10 min. to adsorb 99mTc on the AC column. A trace amount 99mTc is preferentially and completely adsorbed in the AC column. Mo(99Mo) and other nuclides contaminants in AC is removed by flowing H2O, next 6.0 M NaOH (30 mL) and finally H2O. In order to elute 99mTc collected into AC column, H2O is run through the AC column, then the whole quantity of 99mTc adsorbed on AC column can be eluted. 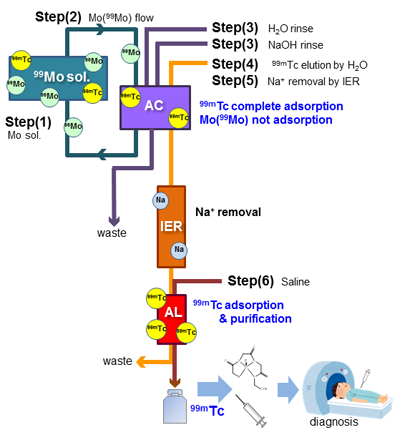 99mTc solution obtained in step(4) above is alkaline solution is flowed through to the strong acid type of ion exchange resin (IER) and the activated alumina (AL). By this procedure, Na-ion in eluted 99mTc solution can be taken hold in the IER column and 99mTc can be caught in the AL column. If the IER column is not used, the TcMM process can also be operated by the combination of AC-AL columns system. Finally, a highly pure 99mTc can be recovered from the AL column by flowing 10-20 mL of saline (0.9% NaCl solution), and the resulting 99mTc can be concentrated 50-100 folds from the initial Mo (99Mo) solution. Copyright 2008 KAKEN Co.,Ltd. All rights reserved.